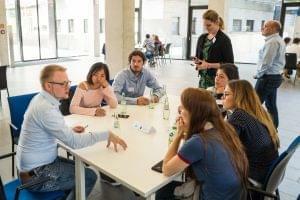 The first Professional Summer School (PSS) took place from 22.08 – 29.08.2018 in Saarbrücken. It focused on job preparation and applications as well as career planning and networking with the industry. The Professional Summer School 2019 will take place from 21.08 to 28.08.19. You will receive further information during the spring. Please keep in mind that the PSS is a compulsory part of the AMASE Master. The registration will start in January 2019. In 2018, both the Integration Week and the Professional Summer School of AMASE were evaluated by the Center for Evaluation. You can find the results in this report.